You are invited to attend Restoration Praise Center's Bible boot camp! "We are ready, set and going forward with Bible Boot camp in the month of August, starting at 5:00 a.m. - 5:30 a.m. Wake up get charged with a morning devotion. Tell your friends and enemies. We are ready to study and pray. We believe the Gospel changes everything... That's the theme, "Change Everything". EVERY ONE COME AND SACRIFICE...Give always also." You can access Bible Boot camp on RPC's official website via http://rpcsda.org/ and USTREAM (http://www.ustream.tv/channel/prayer-without-walls). It streams LIVE from August 1 to August 31 from 5:00 a.m. to 5:30 a.m. It's Thursday and I'm thankful for emergency numbers. Oh, but not the ones you may think! 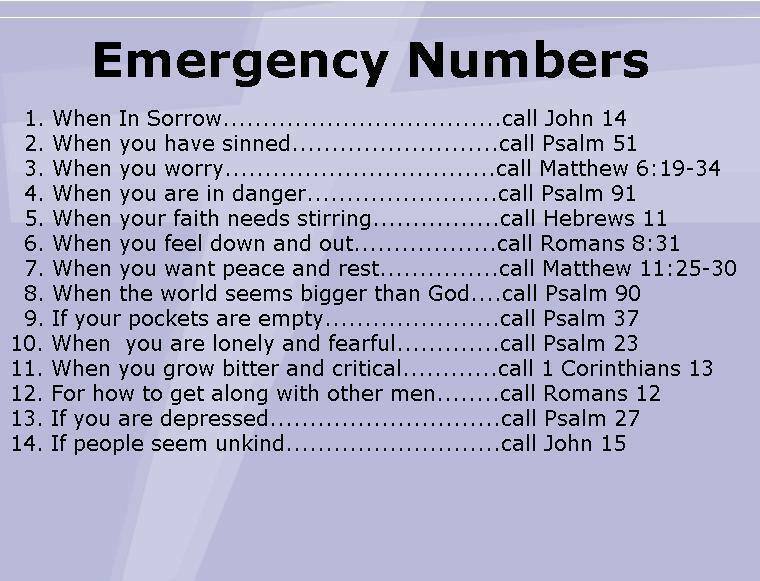 I'm not talking about those numbers you can call in case of a crisis or natural disaster, I'm talking about Bible verses! :) Yes, I found this quite clever photo filled with "emergency numbers" today when I was browsing online and I simply had to share it with you! Aren't you glad there is a God who is ALIVE, SOVEREIGN and always there to help you? Just call upon His name (Jesus Christ) and you will be saved (Romans 10:13). But I do caution you, God wants more than an emergency situation relationship with you, He wants you to walk with Him daily, to follow Him and do what is required of you as a mortal (Micah 6:8 says to "act justly, love mercy and walk humbly with your God"). 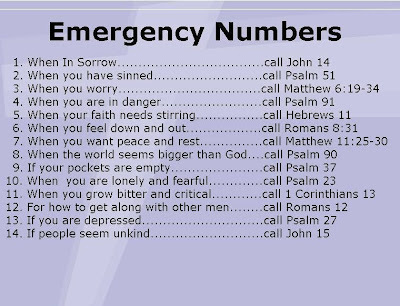 I know that after finding this listing of "emergency numbers," I opened my Bible and started "calling" the verses that can help me with my situation. And guess what? You can too! Prayer is powerful and it works! So before you open your Bible or visit an online version such as Bible Gateway.com, pray to God asking Him to send His Holy Spirit to lead you into all truth as you study His Word (The Holy Bible). And I advise you to do that each and every time before you start reading because the Bible like any other book, can me misinterpreted by the reader. So it's important that you're reading the Bible in your right mind with God's guidance so that you will understand what you're reading and then know how to apply it to your everyday life. So what are you waiting for? Call those emergency numbers! :) God has an answer to any problem you may face. Believe and you will receive (Mark 11:24). "I've gone through the fire and I've been through the flood/I've been broken into pieces, seen lightening flash from above/But through it all, I remember that He loves me and He cares/And He'll NEVER put more on me than I CAN BEAR." I love it when God shows up in the midst of my battle and claims the victory! So I write this to encourage you in your journey. God LOVES YOU, He is there for you and He will fight your battles for you when you believe in Him. :) I am here to say today that I believe in God and I trust His perfect plan for my life which I know He will reveal to me on His time table, not mine. It’s Thursday and I’m thankful for God working in the lives those who love Him to “bring it all together for good”! "Well, what do you mean?" (I figure you may want to ask me that question). *Please note that the use of the word "pregnant" in this text is not literal. The Lord my God has been working in my life and those around me to bring the pain, hurt, sorrow, situations all together for our good. In the past months, I have been reminded of how God is in control and He can convert the most dire situation into rays of sunlight, He’s just that GOOD! I will share details of what I mean in future Thankful Thursday posts on my blog but for now I exhort you to be encouraged and let the Lord fight your battles for you because in the end, God wins! So won’t you choose to be on the winning side? What situation are you facing that you wish some good would come out of it? Take it to God in prayer and then trust Him to turn it around for you. He loves you with ALL his divine heart and He will NEVER leave you or forsake you (Hebrews 13:5). Until next time, take care and God bless you! It's Thursday and I am thankful for God's love because it "never fails," and it "never runs out on me" (as the popular song "One Thing Remains"by Jesus Culture quotes). No matter how many times we fail God, He's there to pick us up, revive and restore our hearts. God is REAL and He is FAITHFUL and He LOVES us with an "everlasting love" (Jeremiah 31:3) and He has promised that if He is for us, then "who can be against us"? (Romans 8:31-39). Nothing can separate us from the Love of God!